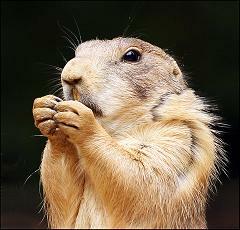 Prairie dogs are burrowing rodents found in the grasslands of North America. There are five different species of prairie dogs, black-tailed, white-tailed, Gunnison, Utah, and Mexican prairie dogs, and are a type of ground squirrel. These rodents can grow up to 3 pounds, and are found in the United States, Canada, and Mexico. In the U.S., most of the population is located west of the Mississippi River. Prairie dogs will eat all sorts of vegetables and fruits, which makes them omnivores. The name comes from the warning call it makes, which sounds similar to a dog’s bark, but the animal is actually a rodent. It’s closely related to the squirrel, and the resemblance is striking. Although the ears are a bit smaller, and the tail is straight instead of bushy, these hole-digging herbivores are in essence ground squirrels. They are also on their way to becoming endangered in many of the states they inhabit because of farming and agriculture. Cattle farmers have concerns that the prairie dog, which lives in large underground communities called “Prairie Dog Towns”, will consume their feed grasses. Also, farmers tend to plow their land with little consideration for the prairie dog towns that are below the surface. It is also common for many with firearms who are bored to use the prairie dog as target practice, threatening entire colonies. The prairie dog plays an important role in maintaining the ecological balance of the prairie and surrounding environments. It’s also the major food source for several prairie-dwelling species, like the bald eagle. What Is The Biggest Prairie Dog Town In The US? How did the Forget-Me-Not get its name and Where did the term Forget Me Not come from?